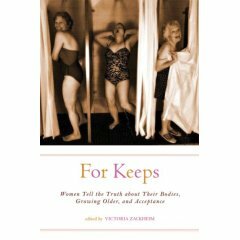 For Keeps: Women Tell the Truth About Their Bodies, Growing Older and Acceptance is a great anthology about the way women view their bodies and all the things that happen as we age (sigh and alas.) Edited by Victoria Zackheim (she also edited the superlativeThe Other Women), it boasts great essays from Abby Frucht, Liza Nelson, Rochelle Shapiro, Clea Simon, Susan Ito, Masha Hamilton, Victoria Zackheim, Leora Skolkin-Smith, Christine Kehl O'Hagan, Ellie McGrath, Susanne Dunlap, Kate Maloy, Deborah Grabien, Louise Ermelino, Sara Nelson, Aimee Liu, Elizabeth Rosner, many more--and me, me, me! There's a reading, too! It's on December 9th at Bluestocking Bookstore on the Lower East Side of NYC at 172 Allen Street at 7. If you come, please say hello to me and I promise to look right at you as I do my part of the reading and I will also draw a really festive looking coffee cup, spoon and fork in your copy of your book. Let us now praise famous websites--and parentheses because this entry has about a million of them. In other news, the Writers Strike continues, and I just got my alumnae copy of Brandeis University magazine--which comes out about twice a year, and yep, they had the old pre-Writers' Strike news that I gave them six months ago--that I was writing a film. Nope, nope, nope. All on hold. Not until the strike is over, which I support absolutely and positively. I'm a huge supporter of the writers' strike. I had a few deals brewing before the strike and immediately put everything on hold. This morning, a friend emailed me to congratulate me on my film deal--something she saw on my beloved UCLA webpage. By mistake, UCLA posted news that I had sent them months ago--well before the strike--but because of the strike, I called them panicked and told them they had to take it down because it was no longer true at this time, and I am not doing any screenwriting work of any kind, nor will I, and could they also post a disclaimer saying that it was taken down because of this? And yes, they will and they are going to, in a few seconds! I feel so less anxious. Another Best Book You Haven't Read--YET! I don’t really know beans about YA fiction, though as my son Max approaches the magic of twelve, I bet I will soon be learning. One of my friends, the novelist Rochelle Jewell Shapiro (Miriam the Medium) recently gave me a just finished draft of a fantasy adventure she’s written called Altivar, the Quest. I wasn’t sure how to read it or what to say—but within sentences, I was enthralled. How could you not fall in love with a story about a moody Prince who befriends a fool, a marauder, and (my favorite) a highly intelligent rabbit named Rowena? It’s really a book about the ties that bind families and the bonds of shared experience that create new ones. Ok. Full disclosure. Leora Skolkin-Smith is my friend but that doesn't mean I can't have a deeply critical mind toward her work. I do. We routinely swap pages and push each other to go further in our work, to dig deeper, to find the facets.We don't suffer fools, gladly or otherwise. I met her during a reading of my own a few years ago, a tiny “meet and greet the writer” in a little bookshop where I sat for hours waiting to meet and greet anyone other than the girl working the cash register. No one showed up. No one. My husband Jeff was there to hold my hand and offer solace, and then this whippet of a woman with long hair showed up with a box of cookies and a megawatt smile. 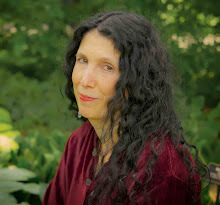 Leora. We’ve been friends ever since, but more than that, we’re also colleagues. Right up until the Writer’s Strike, I was about to do the screenplay for her novel Edges, which has been optioned for film. I carried Edges around with me on a beach vacation and reread it, marking it up for a script, trying to figure out how it was put together and what was the best way it might work. The more I read, the more excited I became because the book has so many different levels, and such brilliance. The pages still smell of chlorine and still have sand in the creases because I couldn't let the book alone. I had to keep reading and rereading to be lost in that world. In the end, I bought two copies just so I could mark one up and scribble obsessively in the margins. The Fragile Mistress strikes me the same way--and right now it's out making the rounds of publishers, agented by Tim Seldes and Jesseca Salky at Russell & Volkening, Inc. It’s a breathtaker, a deeply intelligent and darkly hypnotic novel. Adrienne’s a young woman admitted into a mental hospital in New York City circa 1970s. Patty Hearst era. As Adrienne struggles to cope with this new world, she drifts back to her old ones: her troubled relationship with her boyfriend, her fractious bonds with her mother and father, until she finds solace in a world of her own making—alchemy notebooks. Forget Girl Interrupted—this is something very, very special, very literate, gorgeously written, and provocative. 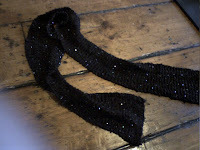 Every writer should learn to knit. It's very Zen and it helps to figure out story problems ALMOST as well as Truby story structure, but not quite, because really, that is the gold standard, and the diamond. Part of the fun of being a critic (I have a column at The Boston Globe and at Dame Magazine, and I review for People) is that you get to dip your literary nose into a whole wide variety of books that you might never have experienced on your own. And part of the fun of being a novelist-slash-screenwriter (but not until after the strike)-slash-writing instructor-slash-editor, is that a lot of time I get to see books before they go out to agents or before they find their rightful homes with publishers. I know the writing and publishing process is so hard—and I always want to champion the books I have loved, so I’ve decided to now occasionally do that here. And while I would never and could never ethically review a book by someone I know or am friends with for the above places (and that includes that person's agent and editor) here in this blog is a little different. And yes, there will be full disclosure in my blog. If I am friends with the person or the editor or the agent, I will reveal it. The Women’s Verses by Linda Lafferty, which is just now making the rounds of publishing and is agented by Kimberly Witherspoon and David Forrer at InkWell Management, came to me first for a blurb. I didn't know Linda. I wasn’t sure I was going to read it because I don’t really read historical dramas. I don’t expect to like or even love them. Let us now praise famous men. John Truby, story structure guru. The Anatomy of Story. Way back when I began to think I might want to write screenplays I picked up a book by the current guru Syd Field. It pushed a three act structure with plot points (reversals) which had to come at certain points in the story. It was sort of a nightmare to try to figure out a script this way, and in the end, I flung the book across the hall. Next up was Robert McKee. He was better on story structure, but I took his class and he was so caustic and bitter that it was hard to realize that I wasn't really learning very much until I left the class, and by then it was too late to ask for a refund. A few years ago I started teaching novel writing at UCLA (a dream job if there ever was one.) I adore the classes I teach, adore the writers in my class, and one day one of the writers mentioned Truby Story Structure. I never heard of it, but I went to the website, and then called the studio to ask if this was something that novelists could benefit from. "Absolutely," a voice told me, and so I took the course, and my life (sorry for the cliche) changed. Truby, first of all, is a bonafide genius. He also has a wonderful dry wit and the most soothing voice I have ever heard, which is just what any writer contemplating hurling her computer out the third story window and herself after it, needs to hear in order to calm right down. He ignores three act structure and instead focuses on the moral needs of the characters, and seven basic story elements (there are really 22, but the seven matter most for a novelist, I think) and slowly, patiently, and brilliantly, he shows you how to shape your story around your characters, how to find the deeper meanings that transform a good book into a great one. I had 400 pges of mess. I reoutlined it with my Truby notes and I was not just able to finish, I saw my theme shimmering up at me, I felt my characters were breathing on the pages, too. He saved my writing life. I know one novelist who tells everyone that she just "follows her pen" and never structures or outlines or thinks beyond her first line. All power to her if that is her way, but for me, and most of the novelists I know, that can be the road to ruin and we wonder if she is insane (Not really, I just threw that in to be witty. She writes fine novels.) You need some moral line, you need some direction so you aren't drowning in a sea of pages. The beauty of this kind of structure is that it offers you a lifeline to hold onto and it isn't one size fits all or restrictive, which is what a novelist wants. You still have room for surprises. You still have to struggle through those dark roads where all you have is the faintest light in the distance. And I swear, it helps me the most after I've done my first and second draft, when I finally am beginning to discover what it is I want to write about. The book is fabulous. And I've invited him to my UCLA class to speak to my students, who are "speaking" a little Truby themselves these days. Go get the book. It's the perfect thing to read during the Writers Strike. I'm not (yet, yet, yet) a member of WGA but I absolutely and totally support the Writers Strike--and everyone else should too-- even though when I called the WGA to ask some questions about the strike, the woman who answered the phone yelled at me to stop asking questions and read the rules. Still despite this clearly under-pressure woman who was obviously having a bad day, the WGA is a great organization and writers don't get the respect or the earning that they deserve. It's hard because right before the strike I had a few irons in the fire and I needed to immediately cool them until the strike is over. Which means I am immersed in reading Truby story structure and thinking about my new novel and writing parts of it, which oh God, is the best kind of joy. For the first time, the ending of my latest novel came to me right after the first chapter. I had no idea how to get to it, and of course, it changed during the writing, but I wrote it in a fever and it changed the whole way I wrote the novel. This was so exciting that I forced--um, I mean, required--my UCLA students to show me their last chapters of their novel first (their whole novels or 7/8 had to be written to get into the class.) Some grumbling. Probably some people questioning my abilities. But then I got a lot of emails from people who also felt their novelistic world had opened up. I'm a little unnerved because I can't think of a last chapter for this new novel or even a name for the novel. Traveling Angels, the name of the novel I just finished, came from this old story about two traveling angels, one of whom keeps saying, "Don't think you know the whole story, because you don't. Things are not what they seem." It also comes from Truby story structure where he talks about traveling angel stories--the stranger who comes into the midst and changes things in unexpected way, but is this stranger good or not? 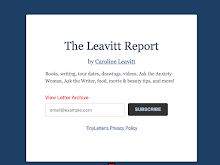 I was tempted to start a name Leavitt's novel contest, but I can't. It has to come from me, me, me. Sigh and alas. 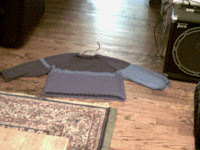 I was going to post Halloween photos of us (Jeff was Allen Ginsberg wearing a Howl t-shirt, carrying ON THE ROAD, a black beret over his long curls and a fake mustache I inked on, Max was a Yankee fan, and I was a sock farm in a pink wig (I spent hours sewing on socks to my jeans and hoody.) But everytime I see myself in the pink wig, I have serious doubts about showing this face to the world again. Tomorrow is the chocolate show in NYC! Speaking of which BLACK BOOK (chocolate plays an important part) is a fabulous video. Some inconsistencies and I wasn't wild about the framing device, but it's a movie that really explores the moral choices of its characters. The heroine is a Jewish woman during WWII who is in the resistence but falls in love with the leader of the SS--a man she is supposed to seduce to get his secrets and free a lot of people. He's not brutal--the film makes him very human, and everyone is really not whom you think they are. She's absolutely wonderful and so are her blogs, so I hope everyone will obsessively go there again and again and again. My cellphone camera is possessed so none of these colors came out right. Every year, my son comes with me to the yarn shop and picks out colors for a sweater. The top color is actually this deep, lustrous navyblue, the mid stripe is sort of robin-eggy blue, and the bottom is this bold true blue. I find that knits really look great against a wood floor! Meanwhile, it is a waiting game. When will I hear about my new novel? Will my scripts sell? (Oh please, please, please--if there are any producers or directors out there, I will bake you a peach pie, I will knit you mittens, I will grovel!) I work a little on my new novel, I try to concentrate. Sigh, the life of a writer...but it still is a great one, and after a stint in the corporate world writing about videos (a nightmare of a job! I got bad critiques because my desk was too messy and because they said they "knew I was thinking about my novel and not about videos and therefore all mistakes would be blamed on me!") I vowed never again. Truly, to wake up every morning without that clutch of panic is just bliss. Pure bliss.